But whether or not to bring children to work is an issue that many working mothers have grappled with at one time or other. 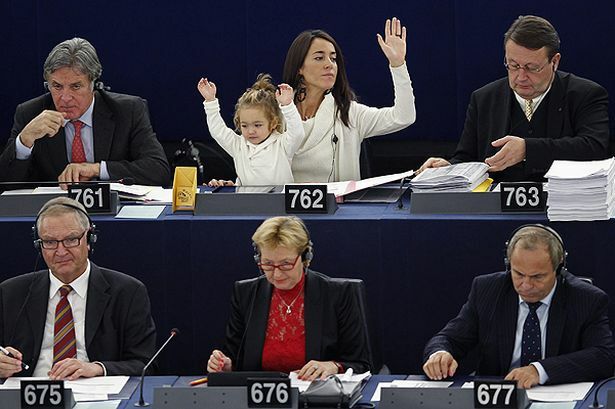 It is, in fact, the issue that has made European Parliament Member Licia Ronzulli so popular with moms like me. The photo above, taken in September 2010, of Ms. Ronzulli at work with her baby has made her a cause célèbre for working mothers around the world. Although she doesn’t bring her daughter to the European Parliament regularly, there are other photos of Ms. Ronzulli and her daughter Vittoria. 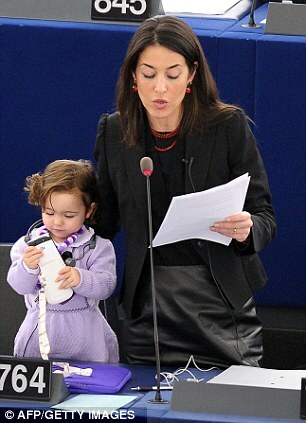 During a vote on the Eurozone debt crisis on February 15, 2012, reporters snapped several photos of Vittoria with her mom at the European Parliament. Now two years old, Vittoria was back in Strausborg – and the European media – just this week. I think that the reasons that these photos resonate so much with moms here in America is that they symbolize so perfectly the work-family balance that all of us working moms struggle with every day. 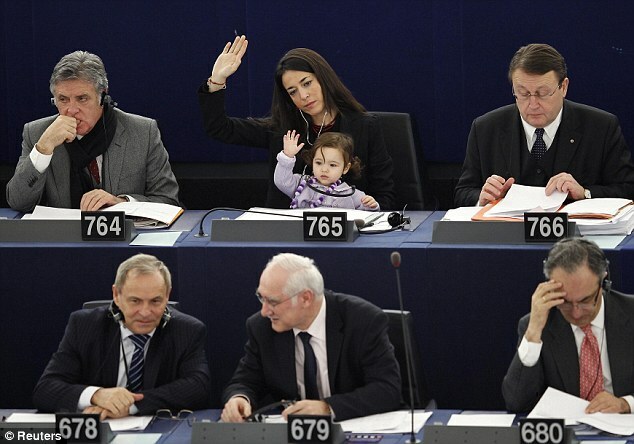 Ms. Ronzulli’s employer, the European Parliament, has rules that allow women to take their baby with them to work. Unfortunately, this is just not an option for most working moms. So we share the photos on Facebook and hope for a day when working mothers have better support. Support such as adequate parenting leave, for example, is important. But Ms. Ronzulli herself was entitled to a parenting leave, but chose to take only 1 month of it. She makes the point that it is about personal choice. In 2010, she told The Guardian “It’s a very personal choice. A woman should be free to choose to come back after 48 hours. But if she wants to stay at home for six months, or a year, we should create the conditions to make that possible,” she said. I would have loved the opportunity to take my kids to work with me. I did in fact do that when my oldest was born. I felt guilty, but I had no choice. I had a bassinet in my office. If we could live in a society where Raising children was as important as the question of aborting them, it would be wonderful! Thanks for your comment, gigglinggranny! I also have felt guilty about bringing my kids in to work and have only done it when I felt I had no choice. With better technology, now I am able to work at home more if I need to. I’m thankful I have an employer that is flexible and has a generous sick leave policy, but I realize not everyone enjoys that. Thanks again for stopping by! I think both men and women should be able to bring kids to work, if needed. Or stay at home with them, if needed. I’m lucky in that I’ve worked for nonprofits that are very family-friendly when I had my boys. Now I work for myself, so it’s even easier. But, most women don’t have that luxury! Thanks for visiting my blog on my SITS Day last week. Love the title of your blog! My child is now an adult, but when I think back to when he was a toddler, my mind reels considering work/family balance issues. Typically, bringing him to work was OK if it meant that I was working longer hours to complete a project, but it was an accommodation granted reluctantly. It wasn’t so that I could balance things in my life at all! It was about the work, “get it done now” deadlines & profits (even for not-for-profit orgs). It took me a while to realize (what on earth was I thinking?) that it was neither normal nor healthy that I kept a sleeping bag and toys under my desk for my son when I would return to the office to work in the evening. But, even with modern telecommuting, working from home would not have been a good situation as I wouldn’t have been able to give the attention I needed to give to him and get my work done as well. I only did it for as long as I did because I was a single parent with few options — and lived in a city with NO licensed daycare allowed after 6pm. Later in my career, as a manager, I tried to be accommodating to employees who needed more flexibility with child care issues but I always wondered if I was applying such accommodations fairly with my staff. As much as I stressed to my employees that it was okay — encouraged even — to flex their schedules if there were constraints or special occasions (like a school program), the working moms always seemed a bit guilty and/or conflicted about doing so. The guys not as much. What mixed messages our society sends to us about being a good employee vs a good parent as if they were mutually exclusive. Hi Anne Camille! Thank you so much for your comment and for sharing your story. It sounds like you made things work for both you and your son. I agree about the mixed messages society sends and do carry my share of “working mom guilt”. I hope you write more about this on your blog. I feel that a lot of women could benefit from your perspective. Thanks and best wishes!